Relations between ethnic groups in Libya’s northwestern Nafusa Mountains remain tense several weeks after renewed clashes in the town of Mizdah. Around 1,500 families fled their homes in March when heavily armed fighters from the Qantrar and Meshashya communities clashed in early March. The fight lasted five days, killing nine people, according to the head of the town’s local council, Abdel Hakim Bedran. Humanitarian agencies have been providing displaced persons, some of them still in Mizdah, with food, medical supplies and non-food packs, including blankets and cooking equipment. Hussein is a member of the Qantrar, one of the two major communities that have lived together in the town for around a century. The National Mobile Force, a unit of the Libyan army, has taken control of the town, 180km south of Tripoli, to put a stop to the fighting, but residents told IRIN that they felt the situation was precarious and that around half the population had fled. The town centre has become a front in the ethnic conflict, in which around 400 homes from both sides have been looted and burned, according to Bedran. Before the March clashes, the town was already split - Qantrar living in the south and west, and Meshashya families living in the neighbourhoods to the east and north. “My parents and my brothers and sisters now live in our relatives’ place in Janzoor, in Tripoli,” Hussein told IRIN, looking at debris of his home, which is located exactly on the boundary line between Qantrar and Meshashya neighbourhoods. In June 2012, the second floor of his house was hit by mortars during an earlier bout of interethnic fighting; in March’s fighting, the ground floor was completely destroyed. “Today, two of my brothers and I are here just to watch the house and to prevent looting,” he said. The town’s general hospital is located in a Meshashya area, making access difficult for Qantrar people. The building is frequently without water, and many of the doctors have fled. “Before the revolution both tribes could receive assistance at the public hospital, but now the Qantrar cannot reach the place,” Aisha Ibrahim, a resident from the Meshashya clan, told IRIN. The hospital cannot guarantee treatment despite receiving some supplies from the International Committee of the Red Cross (ICRC). Wounded people have been transferred to the larger hospital facilities elsewhere in the region, according to Mohmmed Alsweii, head of the Libyan Humanitarian Relief Agency (LibAid). Education has also taken a hit: “The schools are frequently stopped because it is dangerous to go around in the city,” said Aisha, who fled her home in June 2012. Graffiti in Mizdah reads: "This is the war I was waiting for"
While there are primary schools functioning in both communities’ neighbourhoods, secondary schools have been closed since June, and Aisha’s eldest daughter can no longer attend school. Her husband has also been unable to get to his office in a Qantrar part of town. Although the ICRC, LibAid, Mercy Corps, Libyan Red Crescent and the UN Refugee Agency (UNHCR) have delivered hundreds of food rations, blankets and other items in Mizdah and nearby villages, many of the displaced told IRIN that they had not received any assistance apart from that provided by host communities. “The Red Cross distributed humanitarian aid only during the fighting,” Nasra Musbah told IRIN. She is a member of the Meshashya community and has lived in the nearby town of Shgiga since Qantrar militia destroyed her house in Mizdah in June. She lives in a makeshift shelter with her husband and her 16-month old child. She is also pregnant and says she had no money to buy the medicine she needs. “The distribution of aid is a delicate operation. It is not easy to reach all the people in need. We try to pay attention to people with special needs, such as widows and war invalids, who are not personally able to withdraw [from] aid,” Asma Awan Khalik of ICRC told IRIN. But many of the displaced told IRIN they felt abandoned. Ramadan now lives with his family in a compound on the outskirts of Tripoli, in the district of Gyps. The compound consists of 10 apartments, all inhabited by Qantrar families. LibAid told IRIN that it was difficult reaching all the IDPs because they are not concentrated in one area. The tension between the two communities goes back far beyond the recent civil war. Qantrar leaders say their presence in the mountains long pre-dates the arrival of the Meshashya, who some Qantrar leaders accuse of illegally occupying their land. “[Former Libyan leader Mummar] Gaddafi gave the land to Meshashya, known in Libya as his historical supporters,” said Hussein. 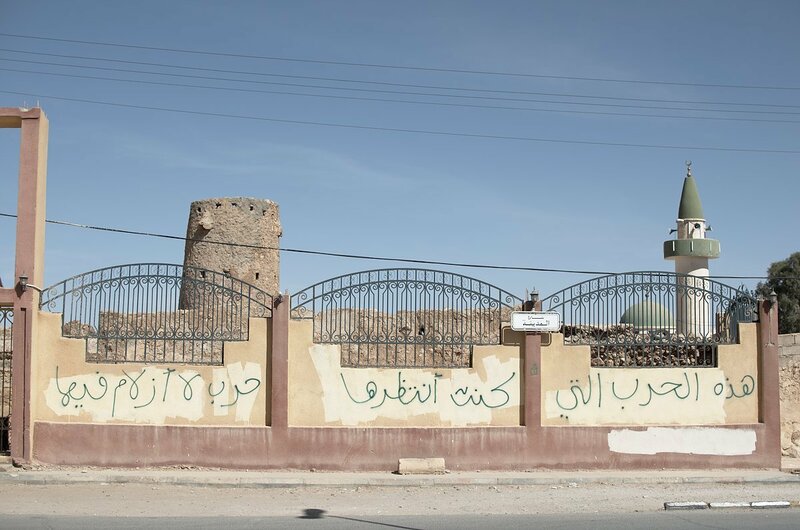 According to members of the Qantrar community, Meshashya were settled in the area by the Italian colonial authorities, and their status was reinforced during Gaddafi’s 42-year rule, as part of an attempt to undermine the influence of the Qantrar. For their part, Meshashya leaders say the Qantrar community wrongly accuses them of being Gaddafi supporters. They say the Qantrar have unfairly seized their land. "We were with them to fight during the revolution. But now they want to get rid of us"
“We were with them to fight during the revolution. But now they want to get rid of us,” said Muna, from the Meshashya community. She has been living with relatives since her home was destroyed in clashes in June 2012. Five elders from the National Reconciliation Committee, appointed from the city of Tobruk, which is seen as neutral, have been seeking to calm tensions in the Nafusa Mountains since July. “We delayed our engagement in the Mizdah crisis, but since the recent clashes we have started enacting a series of proposals,” committee member Hussein Al Habbani told IRIN. Following last month’s violence, the National Reconciliation Committee set up an arbitration committee made up of five retired judges with the power to help solve legal problems related to housing, land and property disputes - widely seen as the underlying causes of the ethnic tension. Property rights are complex in Libya because of resettlements, nationalization and land redistribution policies from the colonial and Gaddafi eras, and also because the latter oversaw the public destruction of property records in 1986. But he said the recent violence was about more than property rights. He said that pro-Gaddafi fighters were still active in the Meshashya community, and added that the reconciliation committee had reported the names of alleged fighters to the Ministry of Defence.